Heat Protection 101: Fry Eggs, Not Hair. 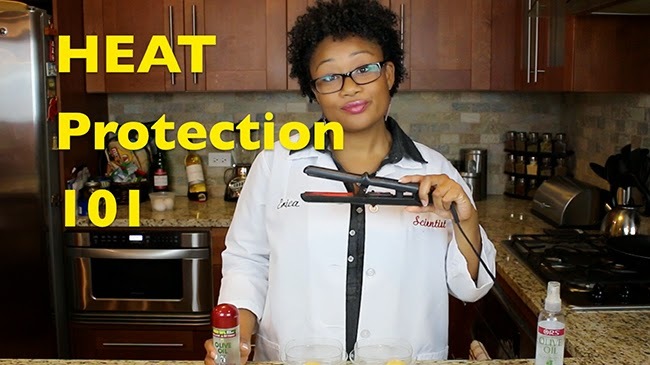 Fall is approaching and some curlies are ready to fry, dye, and lay those curls to the side, but this should be approached with caution. I know you want to use that edge control to get that swoop game tight this season, but there is a right way and a wrong way to do it! Some curlies are anti-straight but one thing is for sure, all curlies are pro “don't put me in a box” so let’s support one another’s choices. If you choose to take advantage of the cold weather for long-lasting straightened styles, then you should do so with the utmost care to protect your curls, coils, and waves. Writer and product chemist extraordinaire Sister Scientist recently used eggs to illustrate what happens to your hair when you use heat tools without protection. If this is not convincing, I do not know what is! As a fine-haired curly, my favorite heat protectants are ApHogee's Leave-in Conditioner (it's a liquid, super light and adds body) and Nexxus Promend's styling spray. Remember to look for a serum or spray with hydrolyzed proteins, quats, PVP and/or silicones such as dimethicone, as these ingredients have shown to be effective in the struggle. Happy heat styling!